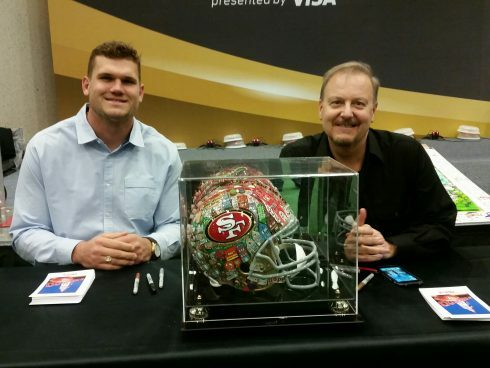 Updates from Super Bowl 50! What a week it’s already been. Charles Fazzino has been all over San Francisco: The NFL Shop, Locker Room by LIDS at Macy’s Union Square, SI.com, Fox Sports, NBC Sports……and it’s all just beginning here in the City by the Bay. Here’s a rundown of events so far. 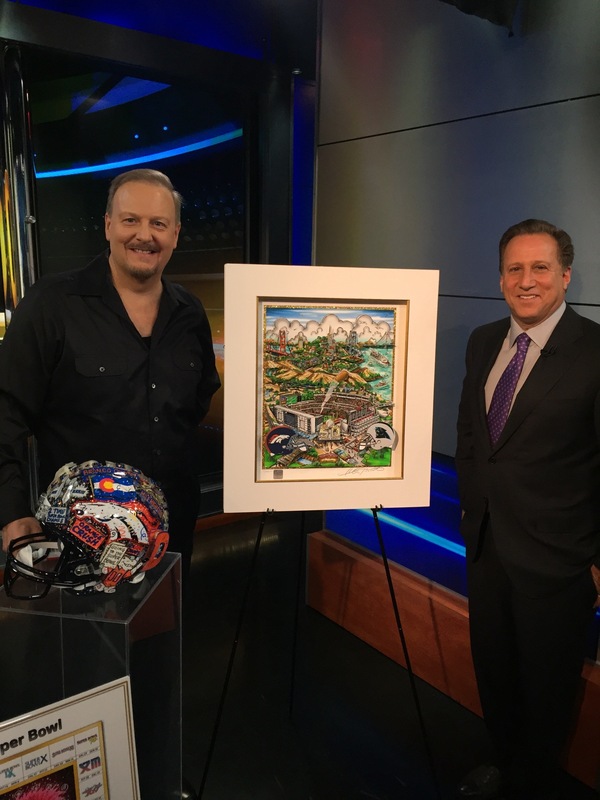 On Sunday before leaving NY for San Francisco, Charles Fazzino was a guest on Bruce Beck’s Sunday Night Sports on NBC in NY. 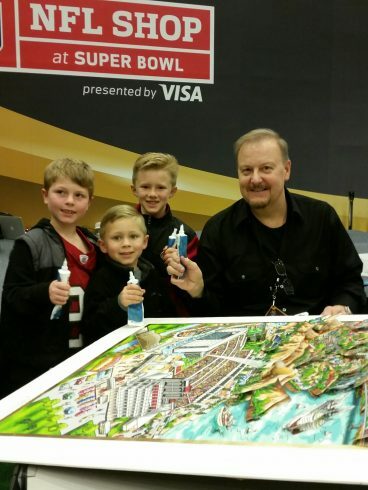 Bruce helped unveil the Super Bowl 50 artwork and introduced the new collection to fans all over the region. On Tuesday, Charles Fazzino joined NY Giant Rashad Jennings, 49er Vance McDonald, and Oakland Raiders Jamize Olawala and Andre Holmes at Locker Room by Lids at Macy’s to unveil a very special piece of art to benefit Rashad’s charitable foundation. 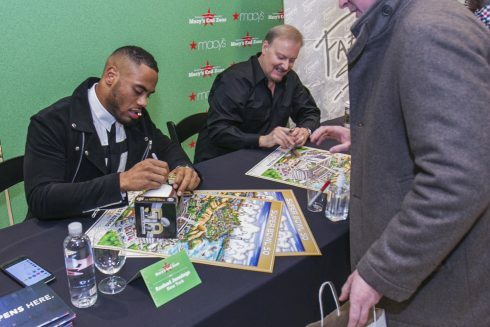 At the unveiling, Rashad spoke eloquently about his new Locker Room Project initiative to mentor and provide inspiration to high school kids throughout the country. 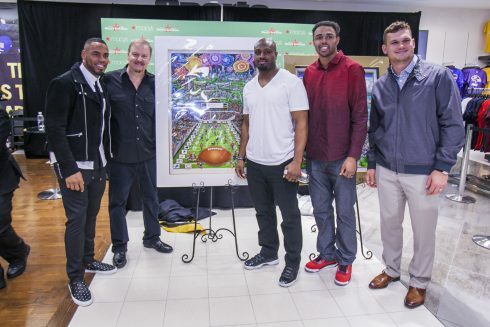 The artwork is a tribute to his involvement and the involvement of many NFL players around the League. 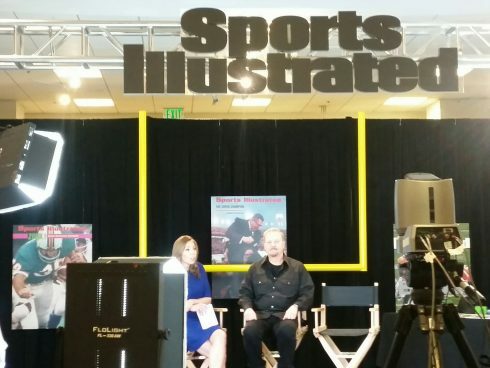 On Wednesday morning, Fazzino opened the SI NOW live streaming broadcasts from the Sports Illustrated Experience at Macy’s Union Square. He sat with host Maggie Gray and then created an artwork live on-air to commemorate all 50 Sports Illustrated Covers! 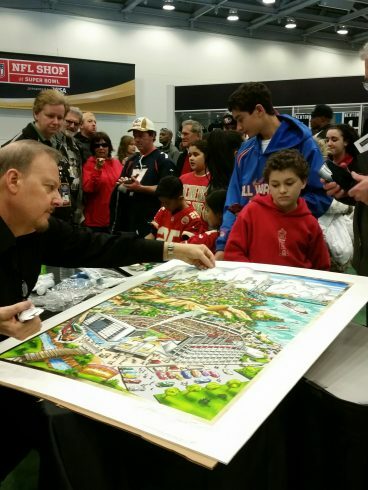 On Wednesday afternoon, Charles Fazzino conducted an interactive art workshop at The NFL Shop. 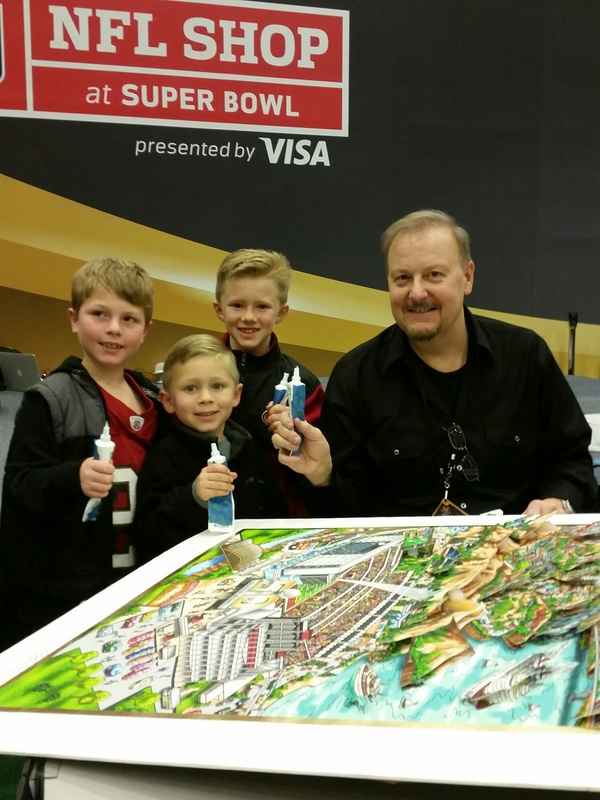 Dozens of fans, both young and old, lined up to contribute to a collaborative Super Bowl 50 artwork that will be auctioned off to benefit Rashad’s Locker Room Project. Also on Wednesday, Fazzino sat with San Francisco 49er great Vance McDonald for a poster signing at The NFL Shop. Still on tap? Autograph signings with Minnesota Viking Andrew Sandejo and NY Giant Rashad Jennings and a live appearance on NBC’s Today in the Bay! 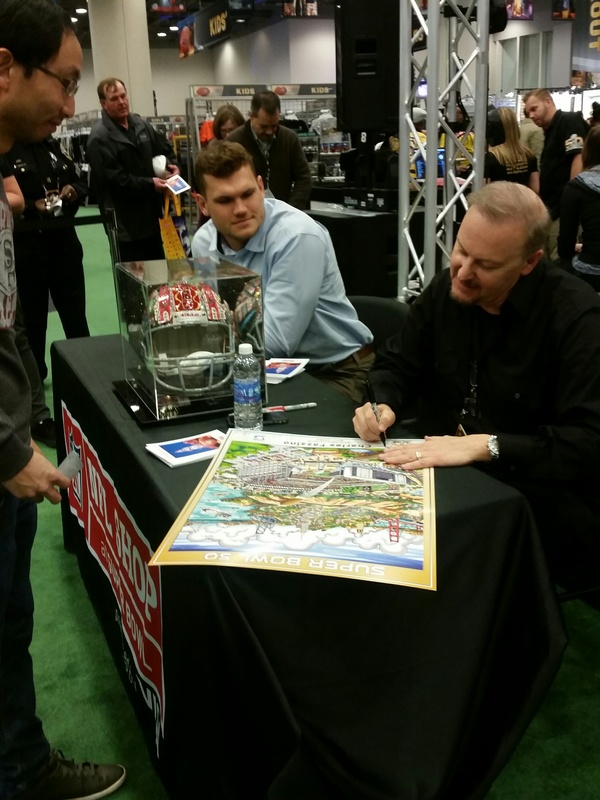 So stay tuned…much more to come!